CARA HORGAN is on her way to the top of the acting world. 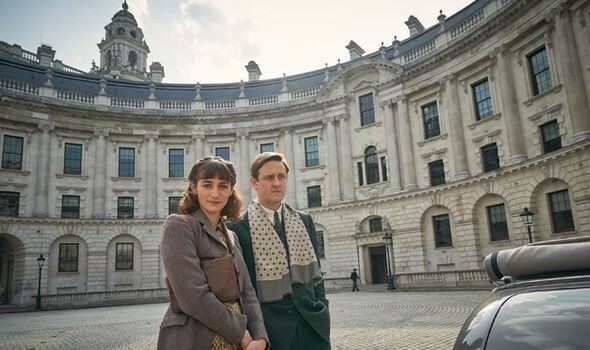 On her way, she checks in with us to talk about Traitors – a new spy thriller set in 1945 London currently airing on Channel 4. AC: Tell us about your character in Traitors. What can we expect from Rae as the show progresses? CARA HORGAN: I play a Jewish woman, Rae Savitt, who works as a typist in the Home Office. She hides her religion from her colleagues due to her fear of the antisemitism so present at the time. Rae is a woman dealing with many conflicting dynamics. Her class prevents her from reaching her absolute potential professionally and so much of her passion is channeled into her politics and the cause in Palestine where her husband is fighting. She secretly raises money for the soldiers in Palestine by selling nylons on the black market. Throughout the series Rae becomes much bolder in her political views to the extent where she feels she can no longer hide her truth. This eventually leads her to being terminated from the Home Office due to an outspoken outburst in the Cabinet Office. She feels confident that she will find other work, but the flame is now lit within her to fight for what she truly believes in. She is also rebuilding her relationship with her son who was evacuated during the war and has become estranged to her. Rae’s journey is one of finding inner strength and no longer being afraid to be who you truly are. It’s a great cast. Do you have any funny stories from your time on-set? It was such a lovely cast! My character and Emma Appleton’s character, Feef, don’t really like each other, which was so great to play because Emma and I have become really good friends. I had a few funny experiences with props on this job. Our props team were so great. We often worked with authentic pieces like our typewriters, which were such a battle to type fast on, I had to constantly fudge that they weren’t jammed and mime typing on them. Also, the prop cigarettes were heavy e-cigarettes that required you to draw really hard on to produce any smoke. That being said, there was no way to make Rae look like she smoked elegantly! The costumes were so authentic and I was constantly laddering my stockings too! In real life, do you think you would be a good spy? I would be inclined to say no because I’m terrible at poker and have very expressive eyebrows! But ultimately, I think it’s all about stakes. As Traitors illustrates so well, when the stakes are high enough, people surprise themselves with the things they are able to do. I think with an atmosphere of war where your life can depend upon being discreet or brave or convincing, I might be able to pull it out of the bag! The drama feels very timely. What attracted you to the project? Firstly, I’ve always wanted to work with Dearbhla Walsh (our director of the first block), so I would have jumped at any opportunity to do that. I have seen many films and television dramas about the war but I hadn’t seen very much about the period directly after the war. The period where people were rebuilding their lives and finding their identities having survived in a very changed country. I think that was a really interesting time in history and I loved the way Bash Doran explored that. I also felt that my character Rae has a really important story to tell about the struggle of women of her class and religion at that time. There must have been so much source material available. How far did you dig into the history? Research for me is one of my favourite things about preparing for a role. 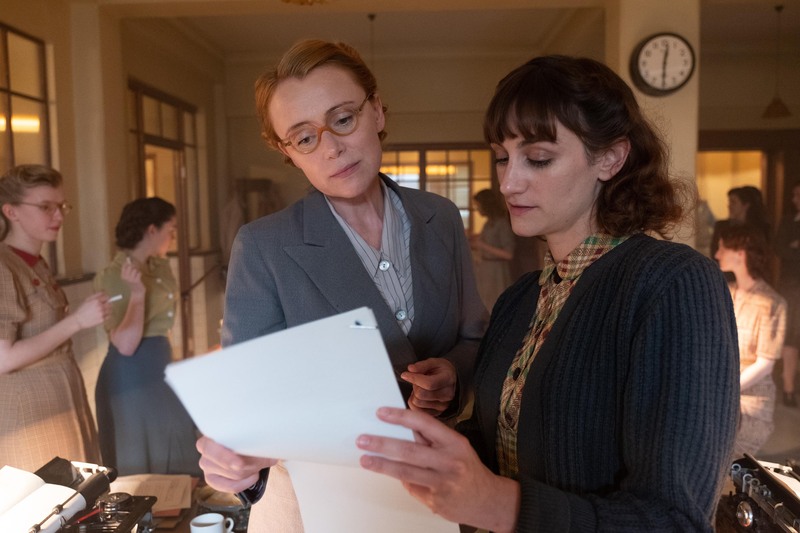 Rae’s story in Traitors explores what it is to be a Jewish woman in England during the war, so I felt it was important to read as much as I could to understand the reality of living under the threat of that terror. I read Night by Weisel and watched some extremely upsetting documentaries including Shoah as well as about the working class in east London during the Blitz. I found so many photographs of women in the 1940s working in typing pools and read accounts from mothers who had sent their children away to keep them safe. Needless to say, the research was all pretty heavy and upsetting but I do feel that it helped me imagine that reality. If you weren’t acting, what career would you have pursued? When I was younger I wanted to be a writer and although I still write now, I would miss the daily interaction with people. One of the things I love about being an actress is the collaborative nature of the work. No film, play or television series is ever created by just one person and it’s the pooling of differing imaginations and talents that makes it really exciting. I also really love cooking, so I possibly would have pursued a career in food. All catering work is quite hard on the body with long hours and lots of being on your feet, but aside from that, I’m attracted to the creativity in cooking. Maybe I would have tried to create a cook book! You’ve done an extensive amount of theatre work. Do you have any more roles coming up? I love theatre work, but currently don’t have any theatre commitments booked in. There is an immediacy of communication with an audience in the theatre which is really satisfying. I suppose for an actor you have a bit more control on stage. You are responding in that moment and when the show is over it is just a memory, there’s something pretty magical about that. I do also really enjoy filming and walking away knowing that now it’s time for other people to create something with what you have filmed. Seeing the finished product months later can sometimes be really different to how you imagined it might be and often it ends up being a really lovely surprise. How do you prepare on the day of a performance? When working on a play, my daily timings change. I’m usually a morning person but I tend to then sleep in much later and try to do some exercise (even though it’s the last thing I feel like doing!) before heading to the theatre around 4pm. I aim to get there really early and give myself time to get onto the stage to warm up, do a vocal warm up and some stretches. It’s also important not to eat too late as well. There’s nothing worse than doing something physical on stage and feeling heavy and possibly having a stitch! I really do enjoy the process of getting ready to go on stage. I tend to look over my script and any notes that have been given by the director before getting into costume and make up. It’s also important to have some quiet time alone too, just to focus and concentrate. What was it like joining a ten-person company a few years ago? For two years I was part of a theatre company at the Lyric Theatre in Hammersmith where we worked on several plays simultaneously and performed them in rep. It was a fantastic company of actors, five men and five women. Our artistic director, Sean Holmes, wanted to look at approaching text in a different way from the usual four or five week rehearsal structure that we tend to have in the UK. We had longer to interrogate each project and really explore a huge variety of ways to approach it. It was an incredibly challenging two years but also enormously rewarding. One of the pieces we made, A Series of Increasingly Impossible Acts, is still some of the work I’m most proud of. Did the dynamics between each of you as performers develop over time? The wonderful thing about working in a company is that you become so close which can make you bolder in rehearsal. We had time to try things that would usually be rejected straight away, which meant that we explored the material more thoroughly and without the polite apprehension that can sometimes be there at the beginning of a new project. Our company was heavily influenced by the European model of theatre making, which is known for being more experimental and subversive than traditional British theatre. As a company we all became like siblings. A real trust is developed which hopefully came through in the work. Occasionally, we would want to kill each other as well. Is there one particular thing you’re excited about for the future? I’d really like to continue to make a variety of work. I’ve been so fortunate to have worked on stage, television and film with such a huge range of material. I consider myself very lucky to be able to make a living doing what I love. I’d really like to be part of a series again if the opportunity arises. it would be great to explore a character’s arc over time and really sink my teeth into something a little longer running. But to be honest, it’s really exciting not knowing what is around the corner so I’m keeping open to whatever comes! Cara can be seen in Traitors on Channel 4 on Sundays at 9pm and all episodes will be available to catch up via All 4.